Culture Under Threat: The future of the 1954 Hague Convention. A joint meeting of The American University of Rome, Blue Shield, World Archaeological Congress, University of Vienna and Newcastle UniversityThe conference will review what actions are currently taken to mitigate the destruction of cultural property during conflict and address what might be done in the future to enhance its protection and to restrict and counter the trade in illicit antiquities that feeds off conflict. The conference will conclude with a discussion of a draft of the World Archaeological Congress’ Accord on the Protection of Cultural Property in the Event of Armed Conflict. Details are available here.In addition H4P will be attending the UNESCO International Experts Meeting : Rallying the International Community to Safeguard Syria’s Cultural Heritage in Paris on the 26th – 28th May. In the framework of the three-year EU funded project for the Emergency Safeguarding of the Syrian Cultural Heritage launched in March 2014, UNESCO is organising with the generous support of the Flemish Government an international expert meeting entitled “Rallying the International Community to Safeguard Syria’s Cultural Heritage”. The meeting, which will take place at UNESCO Headquarters from 26 to 28 May 2014, gathers UNESCO partners and experts specialised in Syrian Heritage and is devoted to the sharing of information and discussion on various aspects related to Syrian cultural heritage, with a view to shaping a future vision for its safeguarding through international cooperation. It will culminate in the adoption of a protocol on cooperation mechanisms and an action plan for the safeguarding of Syria’s cultural heritage during the conflict as well as the recovery phase. Details are available here. The Hotel is a historic building facing the Citadel, built by the Ottoman Sultan Abdul Mahid from donations from the people of Aleppo in 1883. It was the first public hospital in the city; then became a school for nurses. After restoration it became a tourist hotel, but bombing of the rear section last year has caused extensive damage. In February the Islamic Front threatened to tunnel under the hotel and destroy it at the end of February (see the video here, and reported in As-Safir newspaper).On 27th April, they declared a major offensive in the area around the citadel and the Carlton Hotel against the other factions in Aleppo, using the Umayyad Mosque as a base (see video in Arabic here).On 8th May, “Rebel fighters are believed to have detonated a bomb placed in a tunnel beneath the Carlton Citadel Hotel, near the city’s medieval citadel and souk. […] Preliminary reports said the hotel had suffered “huge damage”, it added, without saying if there had been any casualties. The Carlton Citadel is situated inside a 150-year-old building that faces the entrance of the 13th-Century citadel, which along with the rest of the Old City is a UNESCO World Heritage Site. The Syrian Observatory for Human Rights and the opposition Shaam News Network (SNN) said it was being used by government forces. 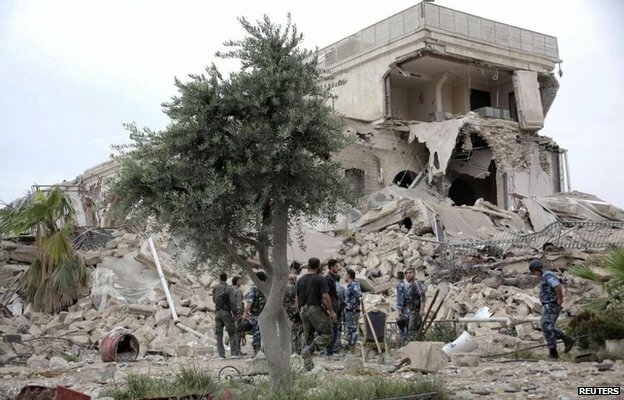 The remote detonation of a large quantity of explosives placed in the tunnel by the Islamic Front had destroyed the hotel and caused the collapse of several nearby buildings, the Observatory said.”Read the full BBC article, Syria conflict: Huge blast ‘destroys Aleppo hotel’, here. As part of their threats against the hotel and surrounding areas made in February, the Islamic Front also threatened the government barracks in the Aleppo Citadel. Photos of the damage, and of how close it is to the Citadel were shared by the Facebook group Aleppo Archaeology here, together with a video of the explosion here. According to the original report by the Association to Protect Syrian Archaeology, the site of Shenshara, also known as Shemshara and Shinshra, and part of the World Heritage Site the Ancient Villages of Northern Syria, was damaged when villagers from Kefrouma resettled there after the bombing of their village. In 2012, 350 families moved there, but by 2013 only 50 families remained. The harsh conditions forced the rest to leave for refugee camps. That report is available here.However, on 9 May 2014 the report was updated as barrel bombs fell on the village. The report and 2 photos are available here and here. “An airstrike on May 2, 2014 destroyed an entire ancient house and the wall of a church at Shinshrah archaeological site. Photo: Abdullah al-Sallum from the Media and Culture Bureau of Kfar Nabel. 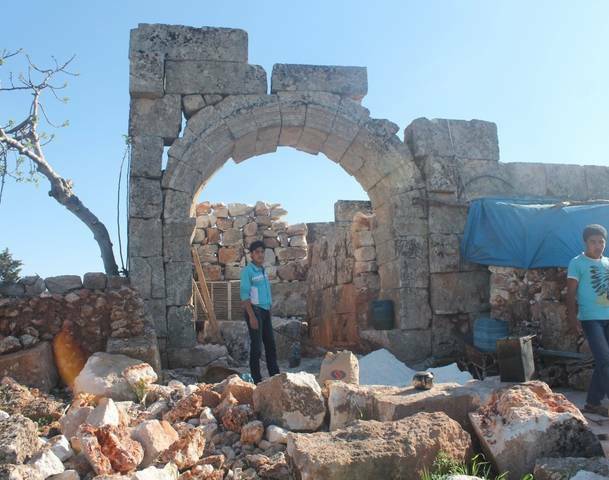 The ancient village of Shinshrah, which includes the remains of five churches, a number of palaces and around 100 houses, currently hosts more than 100 displaced families from the southern part of Idlib province. The new residents have been breaking the massive building blocks from ancient buildings into smaller stones that they sell or use to build huts roofed with tarpaulin. They have also destroyed the entrance of one of the churches, fearing that it might collapse and destroy their makeshift homes. But the internally displaced persons are not the only ones to blame for the damage to the site. 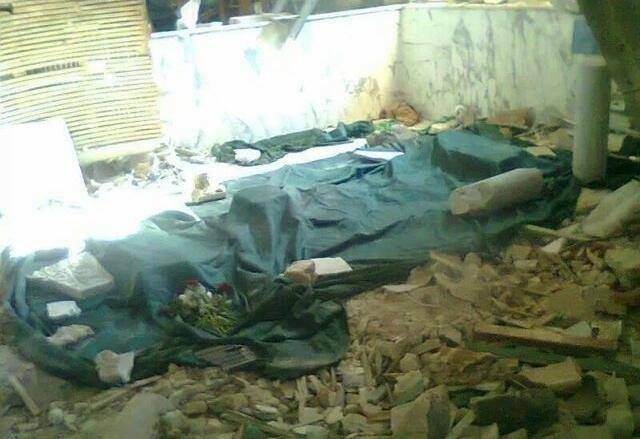 On May 2, an airstrike by government forces killed a man and his two children and destroyed the whole of one ancient house as well as the wall of a church in Shinshrah. It is believed the planes were targeting a new IDP settlement located 500 meters from Shinshrah, mistaking it for a rebel camp. Local officials say they are helpless in the face of the ongoing destruction of this archaeological site. “We are trying to coordinate with international organizations, specifically UNESCO, in order to form a commission to protect these ruins,” said Mohammad al-Alan, the head of the pro-opposition council of Bara village, where Shinshrah is located. “We do not have any forces to protect these sites from destruction. We need donations to form security structures solely for the protection of archaeological sites,” he said. Al-Alan said his council had been explaining to IDPs that the remains would be of importance after the end of the war. 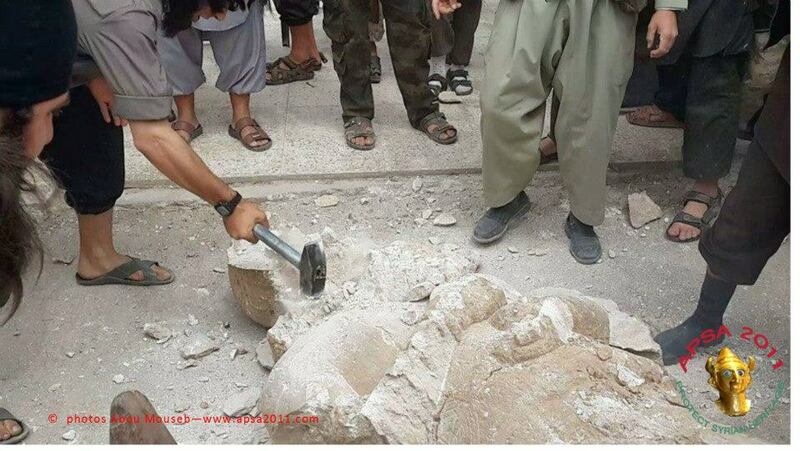 A government committee to protect antiquities has not been able to do anything about the problem, either. Since Shinshrah is located in a rebel-controlled area, the committee only has one staff member there, Hussein al-Aboud. Aboud pointed out that historical sites belonged to the public, not the government, and that it was in everyone’s interests to preserve them. The Culture and Media Bureau in Kfar Nabel has launched an awareness campaign about the importance of archaeological sites and the need to protect them. According to bureau member Hammoud al-Juneid, 35, the organization will provide free drinking water to IDPs in Shinshrah for three months. According to Hammoud, one of the reasons why IDPs sell ancient stones from the site is to afford potable water.”The full interview, “On the ground in Syria: Idlib archaeological site under threat”, is available in Global Voices here. The Association to Protect Syrian Archaeology have released photos and video of the structural damage sustained to the National Museum of Aleppo, available here. 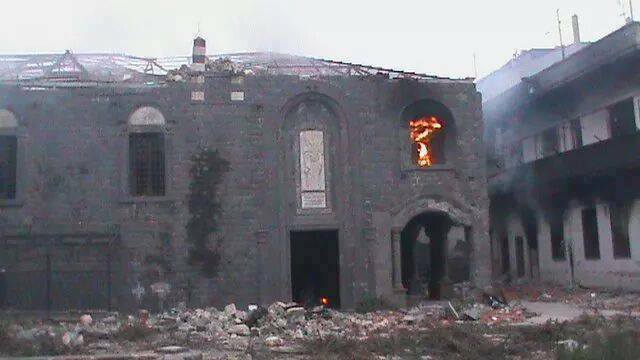 In the last newsletter, it was reported that armed groups apparently set fire to the Church of Um Al-Zenar before they left the area of Homs. The site of the current Church is said to date to 59AD, and the modern liturgy is also apparently 1st century. The church held a belt reputed to have been worn the Virgin Mary: however it has been the subject of extensive damage. The original photo, which was shared by the Facebook group Eyes on Heritage can be found here.Additional photos were released by SANA confirming that the church has sustained extensive damage, and showing the state of the church before. These can be viewed here, together with a brief report. According to information received from the south of Al-Hasakeh region, the Islamic State of Iraq and the Levant (ISIL) has arrested looters of antiquities and intentionally destroyed ancient statues dating back to the Assyrian period found during illicit excavations at Tell Ajaja.This information was shared by the Association to Protect Syrian Archaeology, and is available here. A video was released showing the damage inside the Khalid ibn Walid Mosque in Homs, by the Association to Protect Syrian Archaeology, available here. Click here to listen to a song by Kinana Allouche called “A tour of the Old City of Aleppo”. The music is traditional Middle Eastern music, but the words and video are of the damage. Sotheby’s have recently sold a piece of Judaica, apparently from the ‘destroyed’ Jobar Synagogue in Damascus for more than $40 000 US dollars. In just 2011, the same piece sold for only $5000. In addition, both the provenance of the piece, and the original location, are suspicious. The article also contains some interesting details about the synagogue.Read the full article, Damascus Hide and Seek: Synagogues and Sotheby’s, in the Times of Israel here. 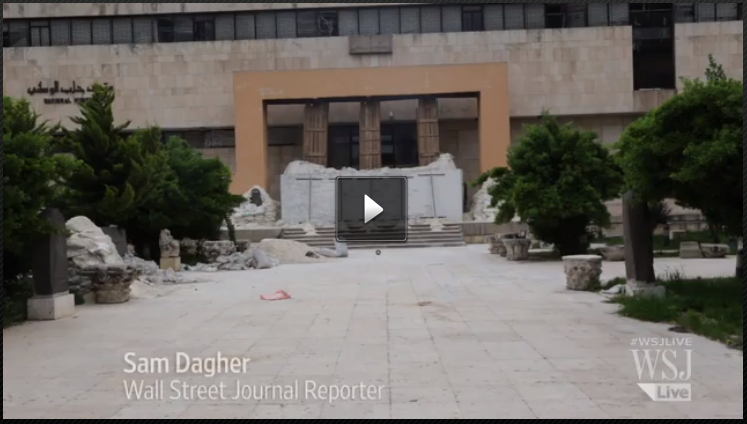 The Jobar synagogue has been plagued by claims of looting and destruction. In addition to the greatly exaggerated reports of its destruction cited above, reports were also circulated that a group affiliated with Al-Nusra Front took “everything they could get their hands on” including Torah scrolls and silverware”. The full article, Plundered Syrian Torah Scrolls said held by Al-Qaeda-linked rebels, is available in The Times of Israel here. However, this report was countered the following week, in the article Syria’s ‘destroyed’ ancient synagogue is still intact, available in the Times of Israel here. DGAM to attend UNESCO experts meeting in Paris 26-28 May 2014, with the aim of approving an international action plan for the protection and rehabilitation of the archaeological heritage affected by the crisis, and looking at the risks to the Syrian heritage, with the aim of coordinating international and institutional efforts to protect it (material and intangible), as well as to discuss restoration efforts and rehabilitation efforts, such as at Crak des Chevaliers. The meeting will include a large number of international specialists in the field of Syrian cultural heritage, as well as UNESCOs partners working the n the field of combating illicit trade.To read the full article on the DGAM website, in Arabic, click here. The DGAM director spoke at the University of La Sapienza in Rome and in Florence, between 4-8 May, giving a series of lectures on the reality of the situation of the Syrian archaeological heritage, attended by a large group of scientists and researchers. In a series of scientific and technical meetings at the University of La Sapienza, Dr Abdul Karim, and the Director of Museums, Dr Ahmed Deeb, met with Professor Paloa Matthei (who has led the archaeological mission working in Ebla since 1964), and a group of scientists, including Professor Giorgio Puccilaty, leader of the archaeological mission at Tell Mozan, to consider ways of joint cooperation between the two parties, in order to encourage Italian public opinion and global interest in the cultural heritage of Syria as part of an international campaign, in collaboration with Mr Francesco Rutelli, the former Deputy Prime Minister, who also served as Mayor of Rome and the Italian Minister of Culture. Additional details including the lectures and attendees can be found on the DGAM website, here, (in Arabic). The Days of Syrian Heritage events will be focussed around the International Day of Culture (18 April), hosted by the Minister of Culture. It celebrates Syrian heritage and highlights the diversity and richness in the fields of art, music, folklore and fashion, and popular and traditional food. A gallery of Damascus Citadel will be devoted to a photo exhibition between 21-23 April featuring 150 images documenting attacks on cultural property and Syrian archaeological and heritage sites. The photo gallery and full article can be found on the DGAM website here (in Arabic). Aleppo Archaeology are calling people to come together to form a national campaign to protect Syria’s archaeological heritage. The call is available here. Colloque: The Syrian heritage under threat – Institut du Monde Arabe, Paris. Wednesday, April 30, 2014. – Address by Mr. Jack Lang, president of the IMA. Michel al-Maqdisi: historical and symbolic dimension of Syrian heritage; situation and archeology before 2011. – Sophie Cluzan: General considerations on the state of Syrian heritage until 2011: institutions, state museums, sites in danger, UNESCO heritage sites, etc. – Jacques Montlucon, engineer: The Syrian expertise: intangible heritage in danger. Interview with Sophie Cluzan – The Syrian Cultural Heritage – nest of the past and the present is available here in French. Entretien Avec Sophie Cluzan – Le Patrimoine Culturel Syrien, « Imbrication Du Passé Et Du Présent » Les clés du Moyen-Orient. 07 May 2014.